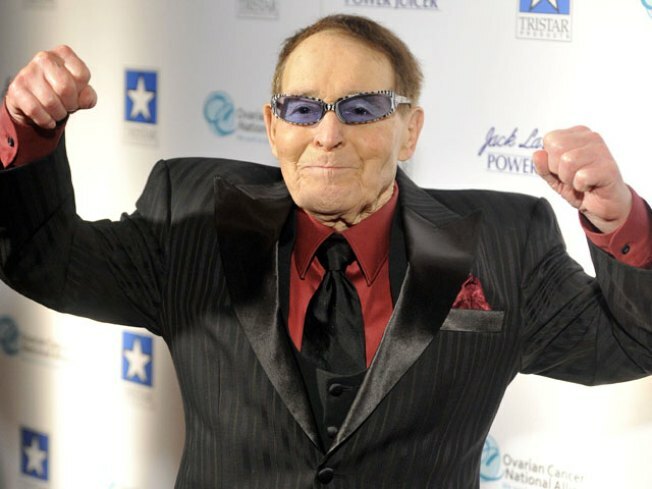 Jack LaLanne flexing it up at his 95th birthday party at the Beverly Wilshire Hotel in Beverly Hills, Calif.
Ripped muscles and a cut, trim physique aren't exactly the images that come to mind when one thinks of a man who's nearly a century old. Unless that man is Jack LaLanne. The enterprising fitness guru turned 95 on Sept. 26 and he'll be celebrating his birthday in true LaLanne style -- with a product bearing his name and a workout. The Bay Area native is in San Francisco Wednesday for a blowout party with hundreds of well-known locals and dozens of politicians. And the fitness guru was surprised by the response he got when returning home. "I couldn't believe all of these people," LaLanne said. "You know, I wanted to cry but I was chicken. What little success I've had, I owe to these people. So God bless them. Thank you for coming. I love them all." An antique fire truck carried the worldwide health expert to John's Grill, his favorite restaurant, and one of the City's oldest and most famous establishments. VIP guests will be filling their bellies on the Jack LaLanne Salad, topped with "Jack's Special Dressing." He was then scheduled to lead 95 health club trainers in a workout session that includes pushups and jumping jacks -- 95 each, of course. "I feel great," he said. "I work out every day for an hour and a half or more. I lift weights, swim. I work out seven days a week. I hate it, but I love the results." Even though his life blood is physical training, he's the first to admit it's not his favorite thing to do. "I hate working out but I like the results," he told KGO-TV. LaLanne and his wife, Elaine, have been married for 50 years. They live in Morro Bay, Calif.
Wednesday's birthday bash kicked off at 11 a.m.